The smile and teeth are among the most important aspect of a person’s physical beauty, and not only that, but most of the time poor dental care affects your overall health. These two are the main reasons more and more people are looking to take proper care of their teeth and why dental care is becoming a sought-after industry. Dental WordPress themes are designed and developed with professionalism in mind and are integrated with specific niche tools that you can use to showcase your portfolio and promote your work. If you are looking for the best dental WordPress themes, check out the list below. Dentalia is a sophisticated and stunning theme custom-built for dentists who want to reach a wider range of audience through their website. It is also built for usability and flexibility while also being easy to customize. Dentalia will allow you to create the perfect website for your organization or business without breaking a sweat. Either you use the fast one-click demo installer or create the layout yourself, it is just as easy. Some of its amazing features are: 25+ custom widgets, team member custom post types, working hours, team carousel, featured pages widget, multiple icon packs, responsive video widget, parallax backgrounds, various section separators, and over 50+ Dental icons. 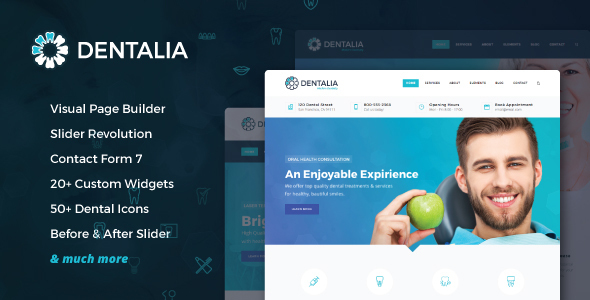 Dentalia is in our list, because is one of the best dental WordPress themes. 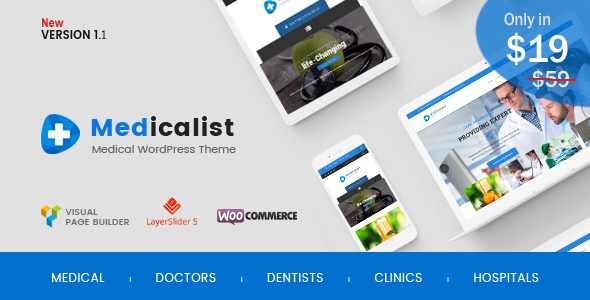 Medicalist is an all-inclusive, all-purpose and all-managed medical theme. It is highly customizable and extremely versatile and it can be used for a variety of healthcare websites from doctors and clinics to hospitals and labs websites. Medicalist comes with a pregnancy calculator, over 6 header styles, over 6 fully managed demos, an appointment system, weekly timetable, services and staff management, and video galleries. This theme has it all when it comes to healthcare – so try it out! Dentistry is a very beautiful, clean and crisp theme focused on aiming the spotlight on the important aspects of a dental website. Dentistry is cleverly developed to be intuitive and easy to use while also being equipped with the right set of features a website in this niche would need to strive. Many dentists prefer Dentistry over other dental WordPress themes because of its sleek design as well as competent features such as the before and after gallery, different layouts, easy customizer, one click demo installer, useful shortcodes, and RTL support. Dentistry is one of the best dental WordPress themes. Developed by one of Envato’s elite authors, Vital, as its name would suggest is vital to a medical related website. 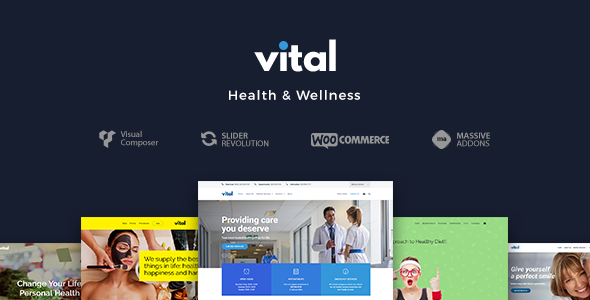 Vital is a modern and versatile theme perfect for health care professional and projects. It comes with a one-click demo installer to get your website up and running in minutes. Vital is also fully responsive, responding great on desktop or any mobile device. I recommend checking out the documentation and the live preview to see what more Vital has in store for you. 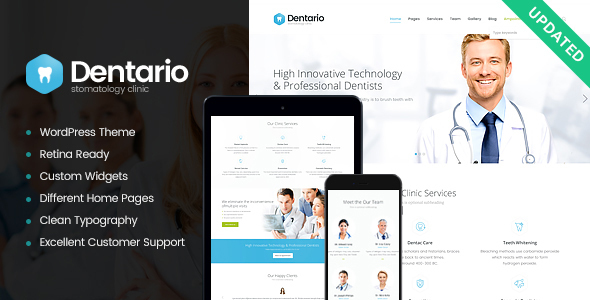 Dentario is a reliable, fast, beautiful and responsive dental WordPress theme. Dentario is a completely intuitive platform for crafting unique and professional websites. This premium theme has everything you need to make functional websites for dentists, stomatology clinics, and orthodontists. Dentario includes beautiful pre-built pages carefully designed and created for this specific niche. The theme is retina ready and responsive; it also comes with Visual Composer, an extensive documentation, and free support. Dentario is fast and easy for everyone to understand. 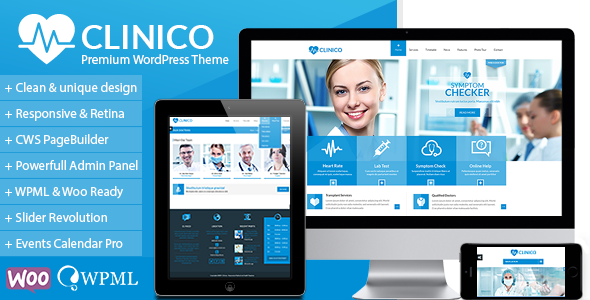 Clinico is a professional, creative and responsive WordPress theme. Clinico is the ideal platform for creating modern websites for the health department. There is no need to write code to get the design for your taste and vision because there are dozens of awesome customizing features you can use. 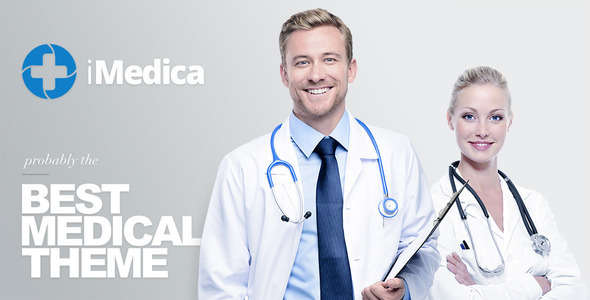 A large number of medical websites are created using Clinico, as you can notice from their incredible sales number. To learn more about this theme, I recommend their documentation or live preview. Divi is a beautifully designed theme, perfectly fitting to any type of content. It is unique, modern and cool without being overbearing. Divi is the ideal theme to showcase your services and amaze your visitors visually. Divi is highly intuitive and customizable and it facilitates the creation of unique and stylish websites. Divi is known for its incredibly fast step up and installation process, that literally takes only minutes. In addition to this, using Divi, your dentist website will be compatible with all mobile devices and browsers. Cosmedical comes with a remarkable, crisp and simple design that will give that extra edge to your website. You may change the skin of the theme through the customizer to make it more you. Cosmedical’s developers prepared unlimited color schemes so you can personalize the theme freely. This premium theme was developed to serve as a great platform for medical websites of any kind. The theme provides an easy to customize template that can be modified through the theme’s panel. 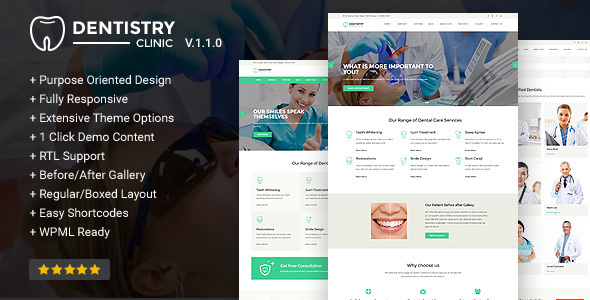 Medison is minimal, flat, clean and modern dental care WordPress theme developed for dentists, dental practices, dental clinics, dental hygienists, and orthodontists. It features a simple design, along with a modular and flexible layout that goes well with any kind of medical website. It offers a premium appointment plugin that saves you $59, unlimited color options, Google fonts, and an easy demo installation. Medison has a clear and concise documentation, and the customer support is always eager to help anytime. 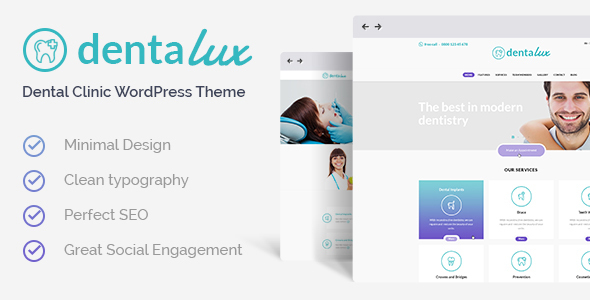 Dentalux is a premium dental WordPress template specially designed for dental clinics and it is equipped with everything such a website might need. Dentalux comes with a one-click demo importer that helps you recreate the demo homepage in a jiffy. You can easily customize your theme’s skin using the unlimited color feature, which can be easily set up via the color picker. Dentalux is fully responsive to any types of devices and adjusts beautifully to all screen sizes; this assures you that your dental website will look amazing constantly. In addition, this themes features several homepage layouts, Visual Composer integration, media content management, shortcodes builder and custom theme admin panel. 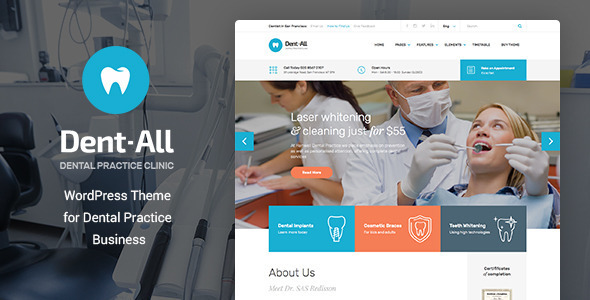 Dentalux has earned its place among the best dental WordPress themes. 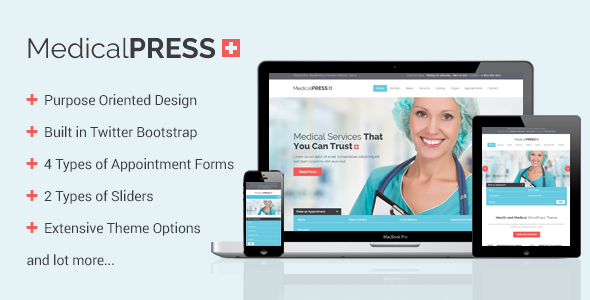 MedicalPress is a stylish yet professional looking WordPress theme. MedicalPress, as its name suggests, specializes in crafting professional and creative medical websites; this theme is easily one of the most competent medical themes on the market to date. MedicalPress includes 2 slider variations, 4 appointment forms designs, 3 features variations, 2 members alternatives, and 2 testimonials schemes. With all these features, it is particularly easy to create a classy and elegant website. In the end, its clean and polished look will attract visitors and convert them to clients. 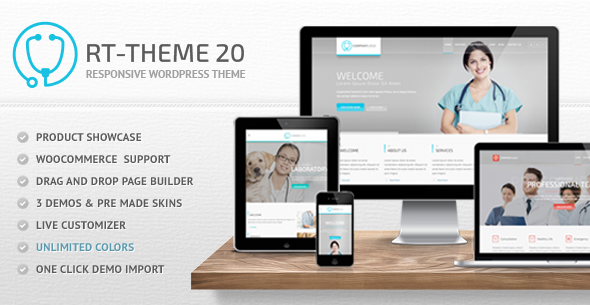 RT-Theme 20 is a clean and beautiful premium WordPress theme created by developed by stmcan with healthcare in mind. RT-Theme 20 is perfect solution for building a portfolio website for a small dental clinic. This theme is comes with the one-click demo importer allow you to create a website from scratch in just a few minutes. Moreover, RT-Theme 20 comes integrated with Visual Composer and Slider Revolution to help you design the layout you want and perfect the visuals. If you are also planning on selling products, you can easily display and sell them using this theme because it is fully compatible with the WooCommerce plugin. 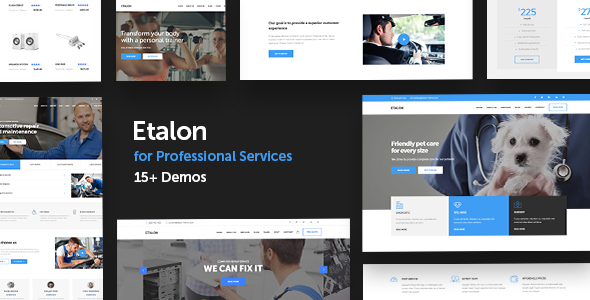 Etalon is ideal for medical and dental websites. All of its 15 demos are designed and built for this niche and you cannot go wrong with either of them. All its features were purposely selected for their usefulness so the theme is not overloaded with features you will most likely never use. Health & Medical is a professional and beautiful theme built for medical oriented websites. This theme is easy and fast to install, and you can also import the demo content if you want a head start in creating your website. Health & Medical is fully responsive and adjusts perfectly on all devices and screens sizes. In addition to this, the theme is retina ready to ensure that your website will look awesome even on devices with high screen resolution. Furthermore, Health & Medical has 2 post slider areas, 6 different portfolio grid columns, 3 portfolio single page styles, 2 portfolio single page slider areas, and left/right blog sidebar layouts. 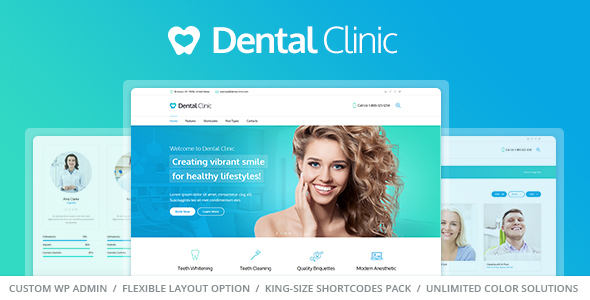 Dental Clinic is an eye-catching premium WordPress dentist theme ideal for health organizations, dentist, doctors, and medical websites. It is 100% responsive and retina ready and runs smoothly on mobile devices and various screen sizes. Dental Clinic has several page options that allow you to switch between boxed and full width layouts, and play with the header. It also includes over 90 custom shortcodes, premium sliders, animations, color management, content templates, and custom post types. Are you searching for a competent and extraordinary medical WordPress theme? Then look no further than iMedica, a stunning, easy to use, and feature rich theme specially built to make your website stand out. iMedica comes with a quick demo installation and more than 20 homepage pre-built homepage ready for use. This theme is highly customizable and allows you to represent your brand truly and fully. It is integrated with a simple drag and drop page builder that helps you create page layouts without touching the code. Additionally, its intuitive admin panel lets you manage the theme’s settings easily. Regina PRO is an awesome medical theme with amazing customizable features that will take your medical website to the next level. Regina PRO comes with an unlimited colour panel, a modern slider, testimonials section, doctors working hours, and many more. Additionally Regina PRO is highly responsive and retina ready.You can personalize it through the theme's live customizer and add multiple sections through the dashboard. 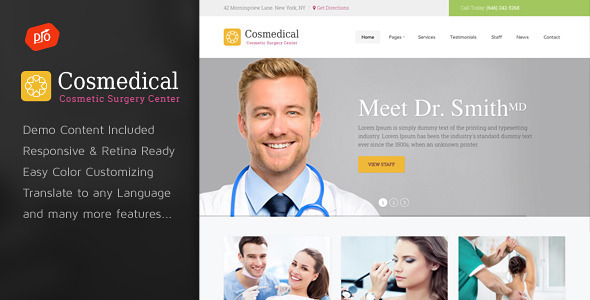 Medical Pro is stunning and versatile WordPress theme fitted for medical websites. It provides 4 specialized homepage variations to make things better. Medical Pro is pixel perfect, fully responsive, cross-browser compatible and retina ready. It has an impressive layout with a bunch of customizable and dynamic elements. Medical Pro includes several premium plugins such as the Booked plugin, TimeTable plugin, Visual Composer and Slider Revolution. It also is translation ready and compatible with WooCommerce. 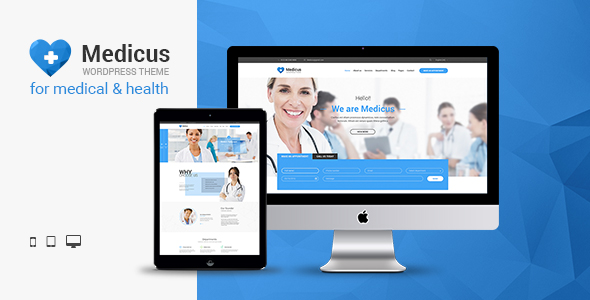 Medicus is a feature rich theme ideal for health organizations and websites. It was designed with users in mind, thus coming with lots of customization options to help you create a professional website for in no time at all. This theme includes 3 homepage variations, a live customizer, 3 custom post types, a responsive timetable, and various premium plugins. Medicus was developed accordingly to the latest standards to ensure a good SEO performance. 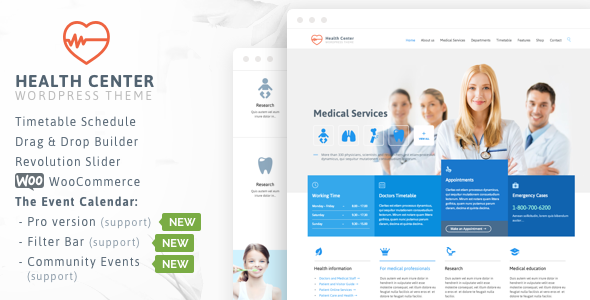 Health Medical Center is a professional, clean and minimal dental WordPress theme that you can use for building medical practices, dentists, doctors, surgeons, hospitals, health clinics, pediatrics, psychiatrist, psychiatry, stomatology, chiropractor, and veterinary clinics websites. If you want to establish a strong online presence then this theme is the one for you by taking design and functionality to the next level. Health Medical Center is complete SEO optimized and lightning fast, two features that you need if you want to make on the online market. Some of its powerful features are: drag and drop page, posts, and portfolio builder, easy parallax builder, shortcode generator, and CSS animations. 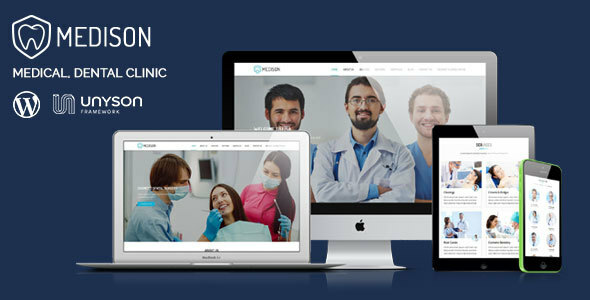 Medical is a premium WordPress theme with a pristine and modern perfect a dentist related website. Medical offers an abundance of design and styling features that will help you create an attention-grabbing yet professional website. In order to help you kick start your website development process, Medical offers 3 homepage demos, fully ready for use. This theme also includes appointment and reservation forms, timetable with links, doctors’ gallery, single doctor profile, customizable mega menu, and 4 skins. 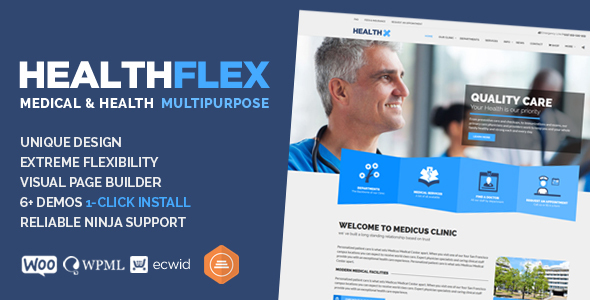 Medi Plus is a new WordPress theme fitting for health care professionals, doctors, and clinics. It was purposely designed and developed with special features for health services along with a responsive layout that displays beautifully on all devices. Medi Plus features appointment forms to better manage the busy schedule and to easily keep track of clients. You can choose to use the premade demo layout or create your own using the integrated Visual Composer, available for free. If you are looking to create a modern, clean and professional website, then look no further than Dent-All. This is an incredibly stunning premium WordPress theme that is fast-loading, highly customizable and incredibly easy to use. All its users will benefit from powerful features essential for websites in this field. Use the drag & drop Visual Composer page builder to create beautiful and unique page layouts, and then improve them custom icons, prebuilt skins, and parallax effects. Some of Dent-All many features are: online appointment booking system, advanced pricing module, and services with pricing. 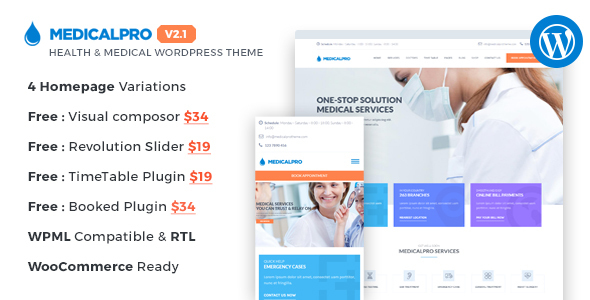 MedZone PRO is an impressive, new, intuitive, flexible, attractive, and responsive medical WordPress theme perfect for any type business in the medical field. This theme's design is clean, modern, and pristine and will certainly make a lasting impression on your visitors. MedZone PRO comes with full widget support, enhanced post formats support, custom slider for facilities, beautiful testimonials, team members section, multiple blog layouts, and so much more. There's nothing you won't love when it comes to MedZone PRO! Apicona is an incredible advanced and powerful theme for health care professionals. It delivers both an aesthetically-pleasing look, and a professional written code. Apicone has many visual customization options, refusing to settle to being mediocre. This theme’s nifty design assures that you will create something that matches your taste. The versatility of this theme is reflected through its features: 12 header styles, unlimited colors, visual builder, 1000 icons included, parallax effects, 4 layout styles, 15 page loader animations, and so much more. Try Apicona today! 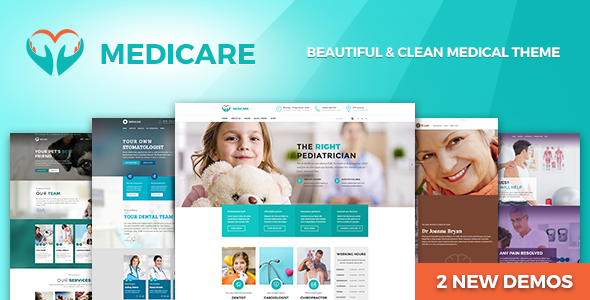 Medicare is a premium responsive WordPress theme specially designed and developed for health, medical or dental websites. Medicare is fully responsive, retina ready and compatible to all major browsers. Medicare has a powerful theme customizer to personalize your theme easily. Use its unique shortcodes to showcase the important information about the provided services. This theme also comes with several unique homepages to select from, and they release more with each update. One of the best features, Medicare has is the fully customizable quote calculator. Healthflex has a gorgeous design and impressive functionality that promises to enhance every aspect of your dental website. It is stylish and flexible and showcases the content perfectly. Healthflex has a bunch of customization settings, so let your creativity shine and experiment with it. The theme also offers 5 flexible pre-built layouts that are fully responsive and beautifully displayed on all devices. Some of Healthflex functionality incorporates customizable contact forms, cool team members’ designs, and an intuitive framework. 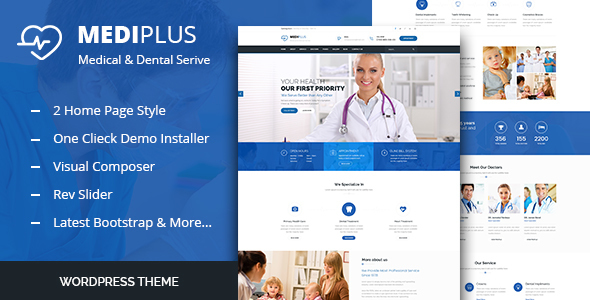 MentalPress is an impressive premium WordPress template that will certainly enhance your dental services website. 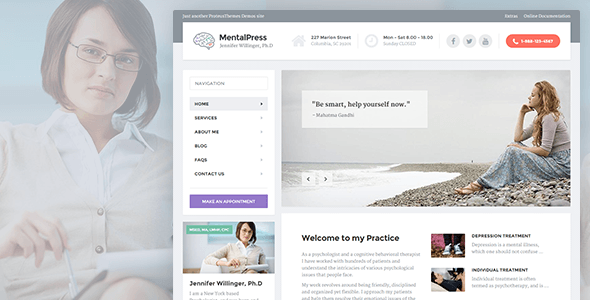 MentalPress can be used by beginners and advanced WordPress users alike, because no coding knowledge is required to use it fully. The installation process is done in a few minutes, and you can easily import the demo content with the one-click demo installer. With MentalPress you can showcase your services or show your best work through the integrated slider, which enables the creation of gorgeous slides. Furthermore, you can customize the theme easily through the customizer in real-time. The dental care and dentist WordPress themes on our list will certainly improve and enhance your website making it stand out. They are all well-suited for stomatology clinics, dentists, orthodontists, and dental care related websites. Selecting one will give you a head start and save you valuable time.